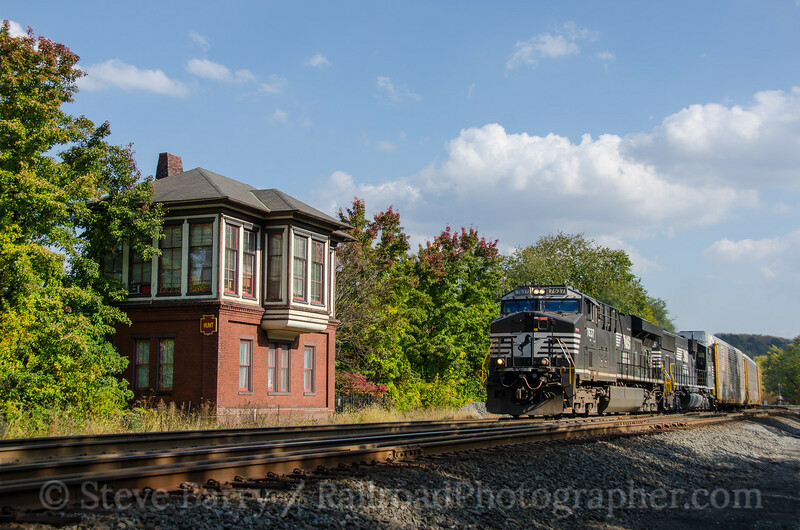 One of the best places to enjoy the colors of fall is western Pennsylvania, especially along the route of the former Pennsylvania Railroad. 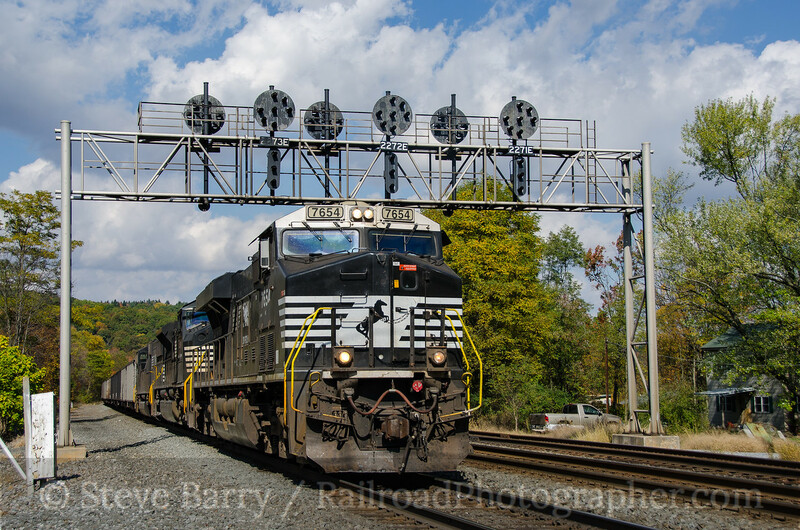 Now operated by Norfolk Southern, this scenic line climbs its way over the Allegheny Mountains, with landmarks such as Horseshoe Curve and the tunnels at Gallitzin along the way. But there is more to this line than the famous landmarks -- the route is lined with distinctive position light signals installed by the PRR. These signals are slowly being replaced, but make good lineside props. 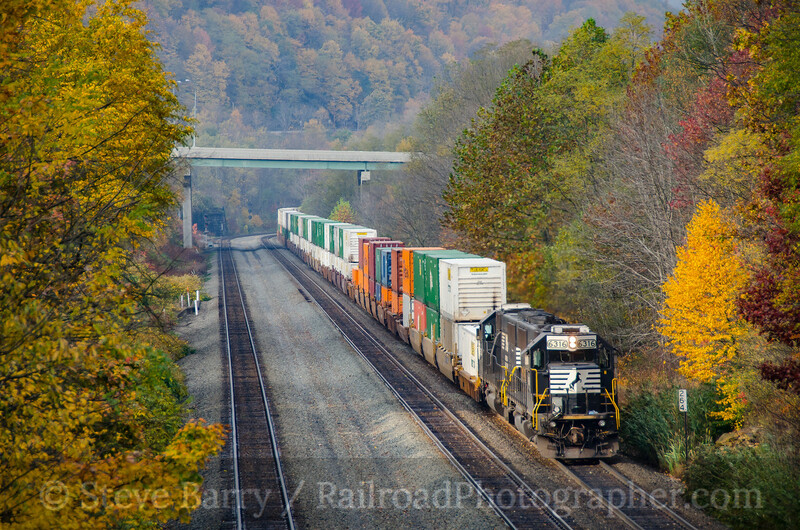 Our day starts in Summerhill, Pa., west of Altoona, where we see manned helper units pushing a stack train towards Pittsburgh (above). Summerhill has a unique signal bridge with PRR position lights -- the signal heads for eastbound trains are on high posts to get them above a highway bridge so they can be seen by train crews. Once again we see manned helper units, this time on an eastbound train, passing under the distinctive signal bridge. Moving to the other (east) side of Altoona, we pause at the small town of Fostoria. Here we find another interesting signal bridge -- a relatively modern bridge with older PRR signal heads mounted to it. We catch a westbound train slowing for the yard in Altoona passing under the signals. It's been a strange fall -- the colors seem to be all over the place, with colorful leaves in some places, green in others. But even the leaves that have changed seem to lack a lot of vibrance. Continuing our tour east, we find mostly green colors in Huntingdon. The former Pennsylvania Railroad interlocking tower in town has been preserved and is used by the Chamber of Commerce. 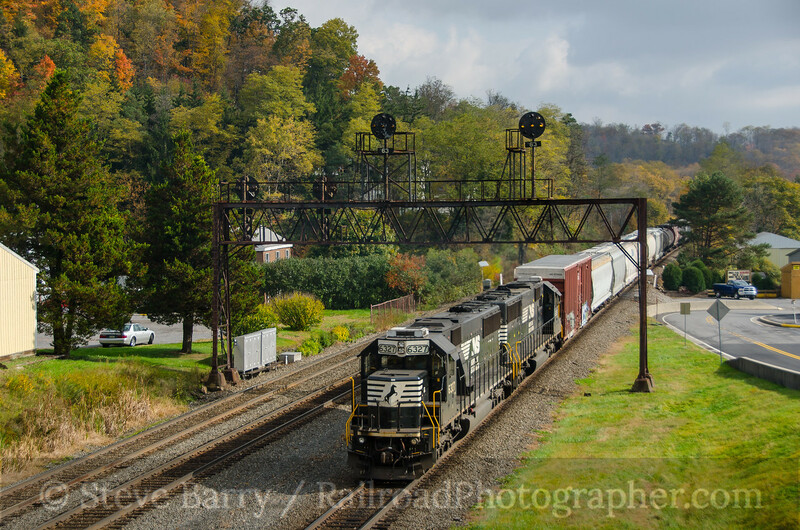 We catch a westbound train passing the classic structure. The sun is beginning to set behind the mountains as we get our last shot just east of Huntingdon at Mill Creek. Amtrak's Pennsylvanian splits the PRR signals as it heads west towards Altoona and Pittsburgh, with Philadelphia and Harrisburg behind it. 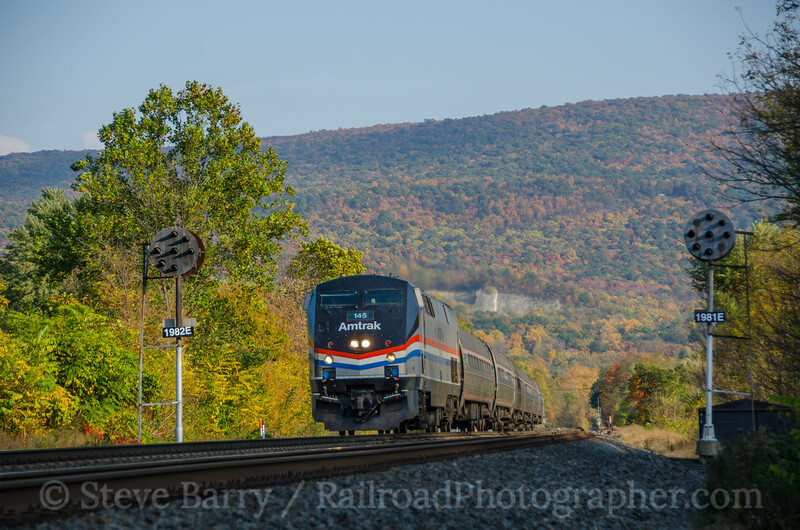 There is some color on the mountains as the train rolls along the Juniata River. There's more to explore, but we're out of time.